Result: Matthias Bachinger defeated Denis Istomin at Halle Open 2018 by 7-5, 6-2. 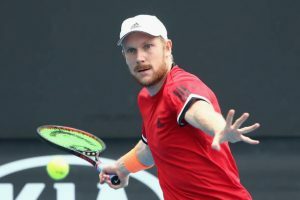 An exceptional performance was seen on the court today by the German, Matthias Bachinger, as he defeated Denis Istomin in the qualifying match of the Halle Open. The lead was taken by Matthias in the first set after some good forehand and backhand shots against Denis. However, Denis chased Matthias and recovered some points but the German was a tough opponent to beat. Soon, the score was equalized 5-5 after a long fight between the two stars. Denis struggled hard to win the set but Matthias grabbed the next two points after some time and won the first set. The second set started after a short break and as usual Matthias Bachinger took the lead. On the other hand, Denis Istomin managed to recover only two points and lost the second set too by 6-2. Matthias won the match by putting up a good fight against his opponent and made it to the next round of the Gerry Weber Open. Matthias Bachinger will be facing Kei Nishikori of Japan in the round of 32 of Halle Open 2018. Result: Denis Kudla defeated Nikoloz Basilashvili at Halle Open 2018 by 6-2, 6-4. Denis Kudla was in great form today as he didn’t let the Georgian professional to won a single set throughout the match. Soon, the first set started and Denis took the lead after some time. However Nikoloz recovered some points but Kudla looked confident as he was gaining points one after the other. After a tough fight between the two, Denis eventually won the first set by 6-2. Now it was all down to the second set for both the players. The second set started and this time Nikoloz Basilashvili took the lead instead of Denis. Nikoloz was gaining points at a normal pace but soon Denis came back in action and recovered the points in a very less amount of time. The scores of the second set were now 5-4 with Denis leading upfront. At last, Denis Kudla won the second set too and booked his name into the next round of the Halle Open. Denis Kudla will play against Lukas Lacko in the round of 32 of Halle Open 2018. Result: Mikhail Youzhny defeated Matteo Berrettini at Halle Open 2018 by 6-3, 7-6. Mikhail won the qualifying round of the Halle Open 2018 from Matteo Berrettini by claiming the victory after winning the first two sets. The first set was a good start from the Russian, Mikhail, as he took the lead after some good forehand shots. However, Matteo recovered some points but Mikhail Youzhny was grabbing points immediately one after the other. Soon, Mikhail won the first set by putting up a good fight against the Italian. The second started which was a decisive one for Matteo that he will play the next set or not. Both the players hunted down for gaining points in this set. After a long fight between them, the score reached 6-5 with Mikhail leading. Matteo struggled hard to win the set but unfortunately Mikhail Youzhny gained another point and won the match. Mikhail Youzhny made it to the round of 32 where he will be facing the Austrian star, Dominic Thiem, in the Halle Open 2018. Result: Lukas Lacko defeated Yannick Maden at Halle Open 2018 by 6-2, 6-3. 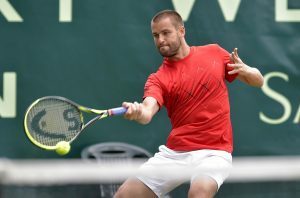 The Slovak tennis player, Lukas, showed an outclass performance against Yannick Maden in the qualifying round of the Halle Open 2018. The first set of the match started and Lukas took the lead after some time. This set took some time to end as both the players made many faults throughout the set. However, Lukas won the first set by 6-2 after his opponent struggled in the entire set. Now the second set was an important one for Yannick as he was down to one set. Soon the second set started and Yannick took the lead this time. But Lukas managed to recover the points after a tough fight. Although, Yannick looked confident as he was leading but Lukas made him suffer when he immediately took the lead and won the set by 6-3. 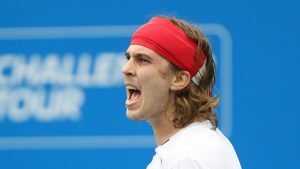 Lukas Lacko sealed the victory over Yannick and booked his place into the next round of the Gerry Weber Open. Lukas will be facing the American Tennis player, Denis Kudla, in the round of 32 of Halle Open 2018. Join allsportspk for the 3rd day highlights of the Halle Open 2018. Next articleBreaking World Cup 2018 – Germany Vs Mexico: The Winner is…?